We always consider the bonus checks from Amazon as free lunches! Our kids are the winners when you shop!! to HealthEd Connect when you shop at smile.amazon.com/ch/27-1115162. Happy Shopping ...and don't forget to SMILE! Grass literally doesn't grow under the feet of the amazing team in Kasompe, Zambia! Last month when we visited the school, we saw bare ground where new classrooms were to be erected. 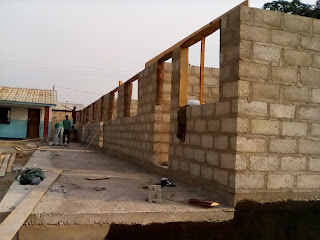 A mere four weeks later the classroom walls are up and ready for a roof. This is an especially exciting milestone for HealthEd Connect since this is the LAST block of classrooms for Kasompe as well as the LAST block of classrooms for any of the schools. All three schools are now complete with individual classrooms to accommodate K-7th grades. Many thanks to the donors that made this life-changing achievement possible. Countless children are now receiving an education who otherwise would have aimlessly roamed the neighborhood and spent their days on the streets. Instead, when we visit the schools the children proudly tell us they are planning to be doctors, pilots, electricians, accountants, nurses, teachers --- you get the idea. With education come dreams and we see abundant evidence of both at Kasompe! Our schools' Good Life Gardens are front and center of the "farm-to-fork" movement! "Farm-to-fork" supports a direct route for food from the grower to the fork. HealthEd Connect's community health workers pluck luscious leafy greens, onions, and tomatoes from the garden plot right beside the cookshack where they make school lunches. It doesn't get much more "direct" than that! 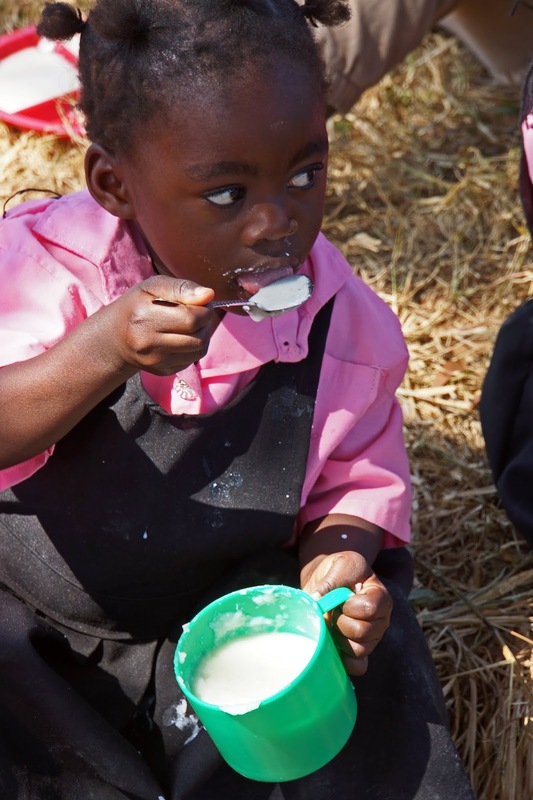 These are the only vegetables many of these orphans and vulnerable children will receive, and they provide necessary nutrients for healthy growth and development. Furthermore, teachers use the gardens as a learning tool, and as the children care for the gardens they learn practical farming skills and scientific concepts. 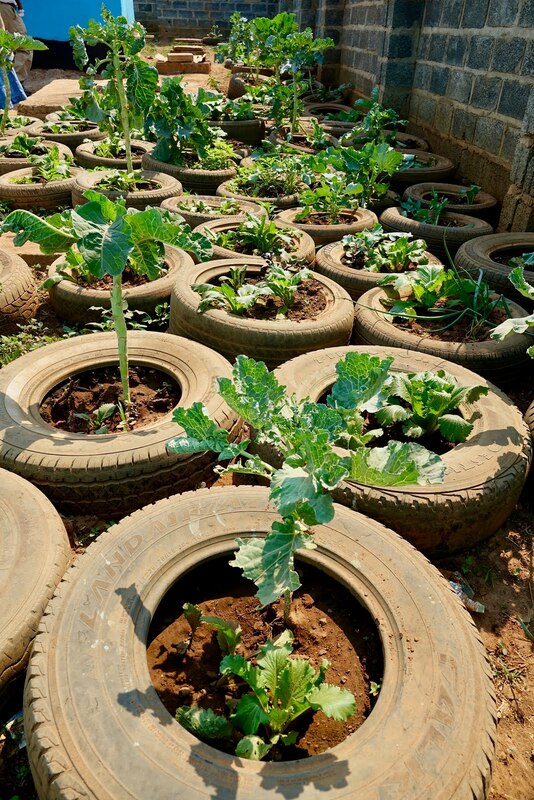 So much goodness from a simple tire garden! Note for curious gardeners: These recycled tires attract sunlight and warmth directly to the roots of the vegetables, resulting in rapid growth and an extended growing season. They also provide excellent drainage in the heavy clay soil of Zambia, and encourage more rapid decomposition of fertilizers. Last but definitely not least, they reduce the amount of weeds and deter some destructive bugs.